Skirts can be bothersome. If you have skirts, you don’t know how to wear them. If you don’t have skirts, you don’t know where to find them. And if you can find them, they aren’t the best skirts. This dramatization exists for many of my clients, which is why they put me on the job to find the best skirts. This past month, these are the absolute best skirts I have found for my clients. . . 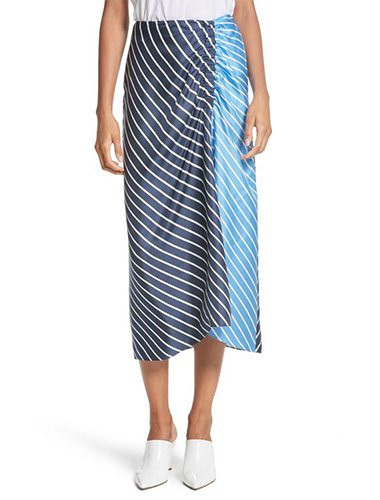 This Tibi Delphina Colorblock Stripe Silk Midi Skirt may look a mess, but it is actually quite flattering if you’re taller. Tuck in a wide button-down shirt, silk shell, or Joie Marru top. This skirt is available at Nordstrom and Neiman Marcus. Kate Spade makes the best skirts when it comes to leather, but this one takes the cake. 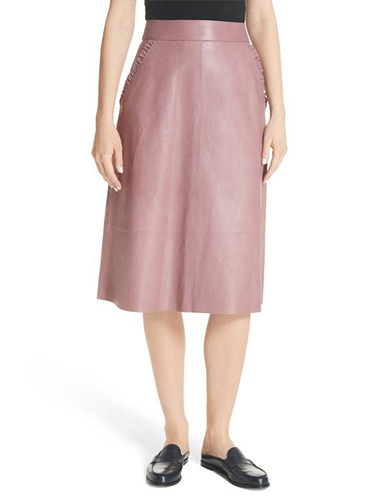 This Kate Spade New York Pacey A-Line Leather Skirt in moody rose is uniquely divine. You can wear this year-round. This skirt is available at Nordstrom and Kate Spade. Sizing Tip: Runs slightly small. Try your usual size and a size up to compare. 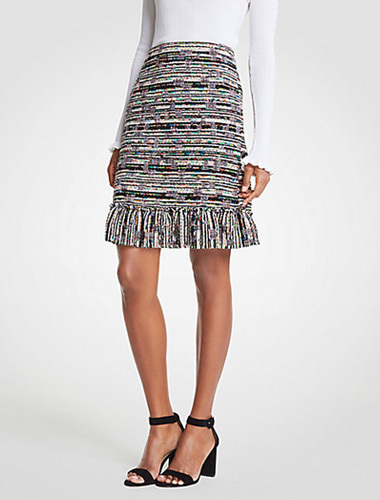 This Ann Taylor Mixed Tweed Ruffle Skirt is so fun and pairs with numerous colors. 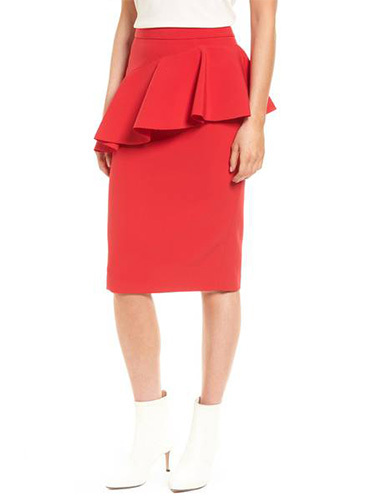 I adore this Halogen Ruffle Detail Pencil Skirt. It’s made of polyester so it doesn’t feel especially luxe, but the skirt is fun and flattering, even for pear-shaped bodies. 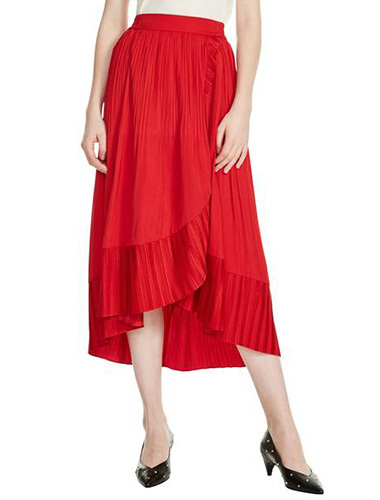 The ruffle is extremely forgiving for any belly or hip concerns you may have. And feel free to hem. For a rather petite client, we are cutting off a good six inches. Dress up for your next fancy brunch or day event in this Eliza J Banded Lace Midi Skirt. 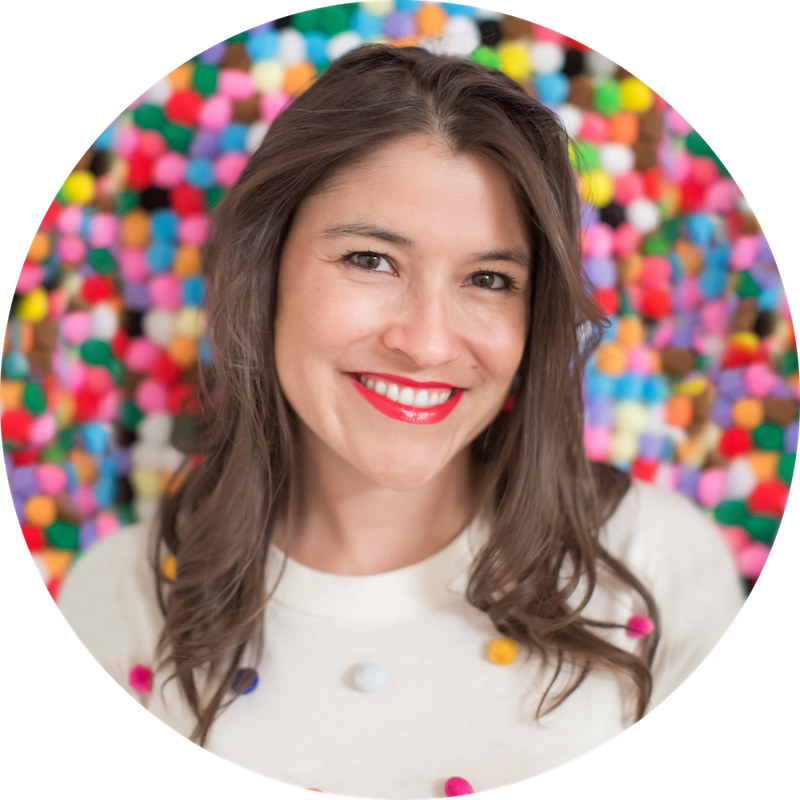 For a poufy skirt, it’s not so poufy, so don’t worry about the cupcake look. Also, if you feel like it is too long for you, have your tailor cut off a tier, and hem the lining. 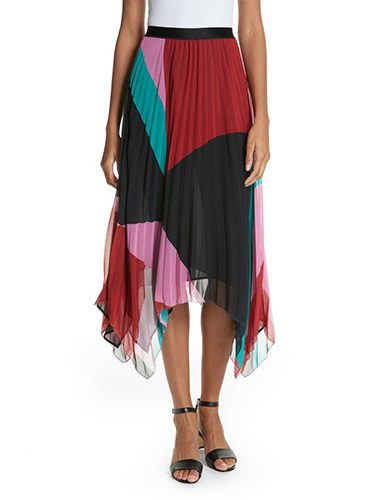 Alice + Olivia often puts out delicious gauzy maxi skirts, but this Tavi Colorblock Maxi Skirt is one of my favorites. Dress it up or wear it casually. I like to pair this Maje Jonette Faux Wrap Midi Skirt in a more casual way versus a dressy look. 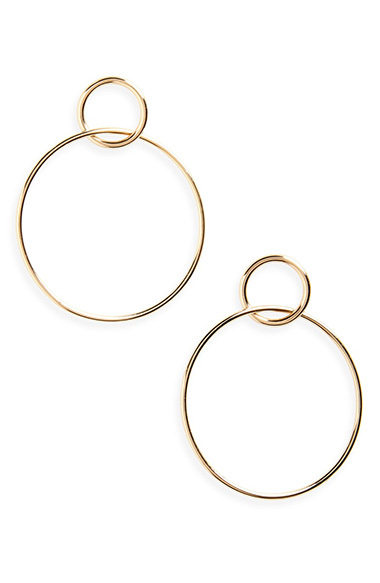 Pair with sandals and a breezy white top for a brunch. It also comes in a shorter version. This skirt is available at Nordstrom and Bloomingdale’s. Sizing Tip: Uses unique sizing. Use the sizing chart to guide you. Talbots seriously impressed me with this Stretch Leather Pencil Skirt. 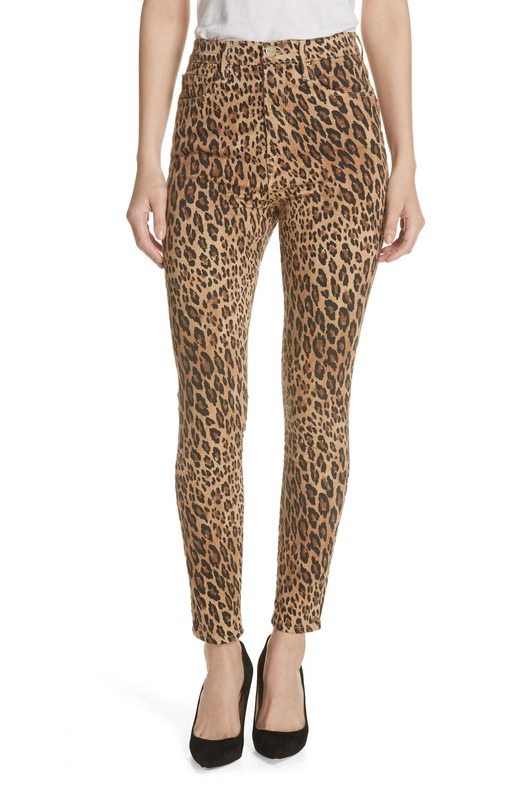 Flattering and chic, it’s a perfect addition to a work wardrobe. You can also dress it up for a night out or a party. Sizing Tip: Runs large. Order a size down. 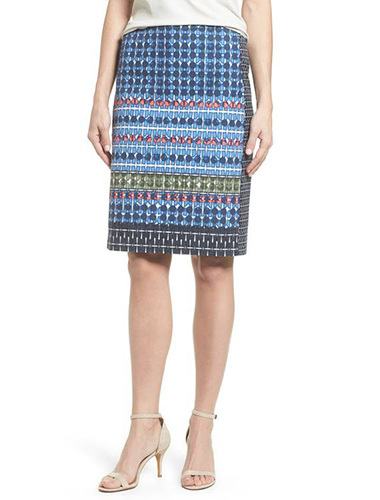 This NIC+ZOE Tile cotton Pencil Skirt looks boring, but it’s delightfully flattering and versatile. You can pair a dressy navy blouse and navy pumps to go to work, or do a breezy white blouse and white chunk heels for a brunch look. The print enables numerous pairings from light to dark blue and green, while coral and yellow could pair nicely as well. This skirt is available at Nordstrom and Zappos. Sizing Tip: Runs large. Order one size down. 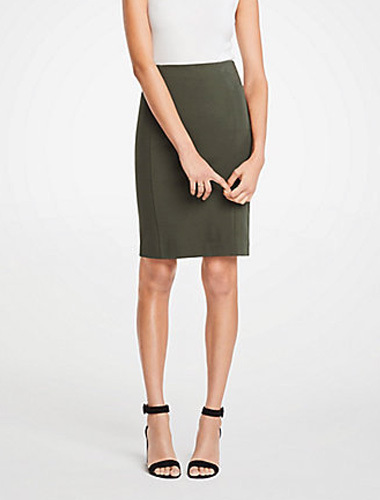 I am always looking for ponte skirts for my clients’ work wardrobes and this Ann Taylor Ponte Pencil Skirt is a perfect staple, and in my beloved olive green. 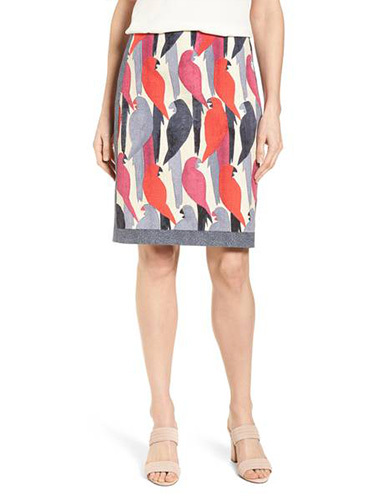 When my client and I saw this NIC+ZOE Flying Around Stretch Cotton Skirt, we gasped. The joyful birds manage to be both moody and artistic. Pair this skirt with this bold Halogen top in purple boysen. Sizing Tip: Runs big, order a size down. This Ann Taylor Doubleweave Pencil ponte Skirt is flattering, comfortable, and unique. The subtle trim and pop of color is perfection. You can wear it for work and play. This is a real client favorite of the best-skirts list. This NIC+ZOE ‘Batiste Flirt’ Skirt has been around for awhile, but keeps working. It is very flattering for apple bodies. This daring Free People Faux Leather Miniskirt is extremely slimming. The faux leather is a little stiff so that it flattens a stomach, but it is not uncomfortable. This skirt is available at Nordstrom, Free People, and Macy’s. Sizing Tip: Free People usually runs large, but this skirt does not. The size 6 fits me, but it’s tight. I recommend going a size up. 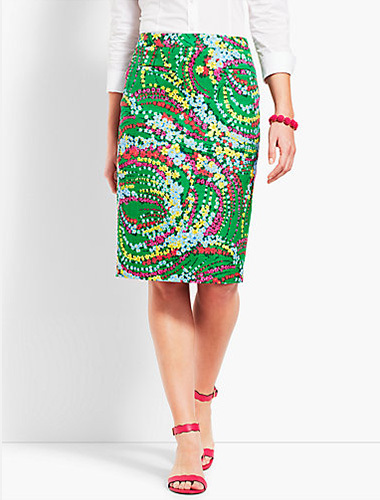 This Talbots Floral Pencil Skirt flatters your body and brightens your wardrobe. 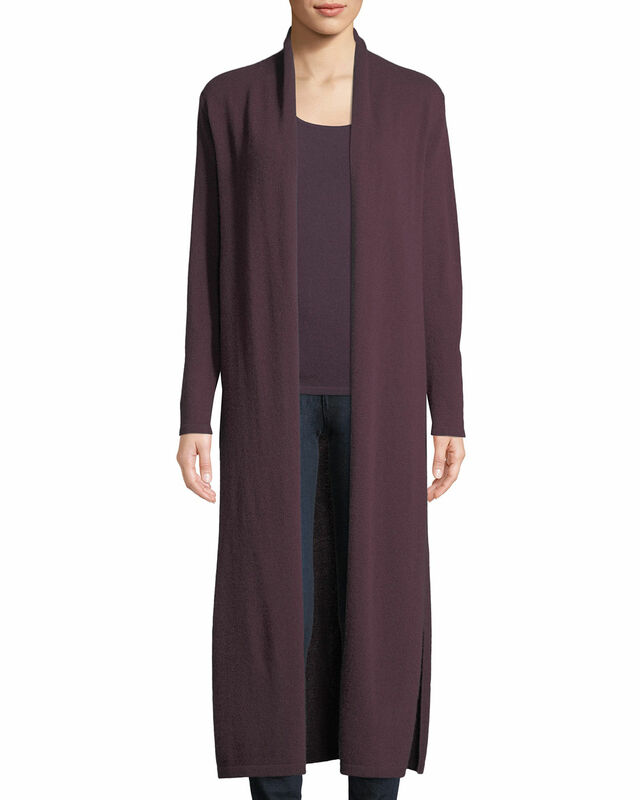 Pair with pinks, reds, yellow, and baby blue. 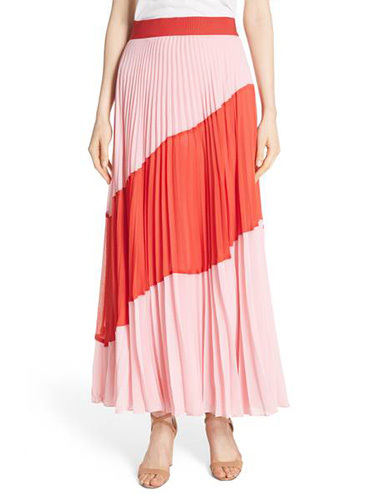 I can’t wait to see this Joie Dashiella Colorblock Pleated Chiffon Skirt on a dance floor. Think wedding, or dressier night out with your friends or lover. This Talbots Suede Gold-Button Skirt is a killer option for clients over 5′7″. Works for the office as well as play. Pair with booties and chunk heels. Some great skirts featured here. I love skirts and work in a conservative office. How would you style the leather pencil skirt in vicuna with tops? Thanks for these suggestions! Apologies for my delayed response. I have just returned from Barbados. Stay tuned for that post! Just because the skirt is leather, doesn’t mean it is risqué. The silhouette is already quite conservative, so simply pair it with a conservative top and classic shoes and you will fit right in as you stand out. More specifically, I recommend tucking in a long sleeve blouse with a higher neckline, or pairing it with a crew neck pullover sweater. J.Crew’s Tippi sweater (https://bit.ly/2qx5CFd) is a fantastic top for a conservative office. Pair it with a classic chunk heel pump, or simple heeled boot, and you should be good to go. I just created this exact outfit for a client yesterday. She looked fantastic! Thanks for the response! I agree the skirt style is conservative and will look for a similar top. Really enjoy your posts, as many of the looks would work for my law firm office. Fabulous! And you are so welcome!